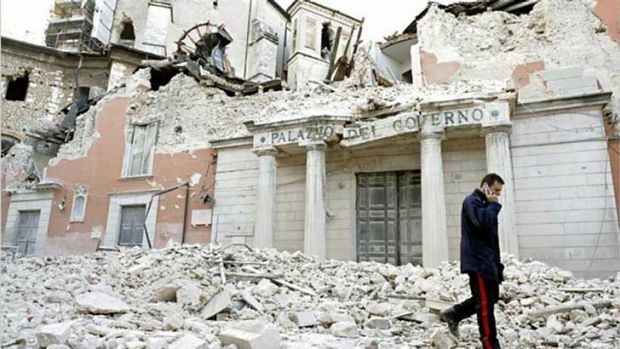 Just few days ago central Italy has been struck by a strong earthquake of 6.4 magnitude causing hundreds causalities and millions of euro of damages, destroying to the ground villages in the affected area. The central part of Italy is a high risk zone for earthquakes, however, earthquakes are more frequent than before. The idea that climate change can cause earthquakes looks, at a first glance, ridiculous. Indeed, most of us think that climate change affects just global temperature, sea levels and ice melting speed. However, that is just part of the whole story. In a study conducted by UCL Professor Bill McGuire, whose findings are reported in his book Waking the Giant, is explained how climate change can trigger earthquakes, tsunami and volcanoes eruptions. The earth surface comprehends three main layers the crust, the mantle and a middle section called the astenosphere. The latter it can be thought as a plastic material between the other two. The movement that runs up the three causes the shakes that sometimes turn out as earthquakes and other major seismic movements. In some regions the inner earth movement is stopped by the presence for example of ice caps, as in Alaska or in Greenland. The big ice-cap works as a force that pushes down the crust and the layers can’t move. Still, they accumulate strain because of the earth’s movement. When ice cap melts, because of climate change, the pressure is released and the crust is bounced back by the inner earth forces. In results you have stronger shakes thank before in the same area, as the previous ice weight has been removed. Supporting this theory there data that show more frequent and more powerful earth’s movement in the two regions which in the last two decades have seen a tremendous resizing of their ice-cap. Geologist also, have recorded that the faults are lot more active now than before. Now, this theory it may be proven for arctic area, but there are many area, like in center Italy that are not covered by ice. Although, also more severe rainfalls and floods can produce the same effects. How? More liters of water pour in the underground basins, which consequently adding more pressure on the faults. As the rainfalls get more severe, this could trigger more earthquakes. Surely, deeper studies must be carried out. But, if is true that something as small as the flutter of a butterfly’s wing can ultimately cause a typhoon halfway around the world, we shall not look surprised if they will confirm the theory ultimately.